Some of you may know this as a crisp light dish that’s moist and flavorful. Others may have less pleasant memories of greasy, soggy cardboard that’s only made edible by drowning it with condiments. If the later sounds familiar, then I urge you to read on and give this simple dish a try in your own kitchen. I wanted to infuse an extra boost of flavor into it so I worked in some grated onion into the meat before breading. The result is a thin, tender piece of veal bursting with flavor surrounded by a perfect shell of savory breadcrumbs. A squish of lemon and some briny capers on top make this a light dish that would go equally well with a salad or some boiled potatoes. Put a cutlet down on a solid surface then cover with a double layer of plastic wrap. Using a wide mallet (I just use one out of my tool box) or a heavy bottomed pan, pound the meat evenly until about 1/8" thick all around. Rub some of the grated onion into both sides. Repeat with with the other pieces. Salt and pepper the cutlets (go easy on the salt, the meat is thin and the breadcrumb may already have salt) then dust them in flour. Get 2 shallow bowls ready, one with the beaten egg and one with some breadcrumbs. Dip the meat into the egg first making sure you cover every bit of the cutlet, then put it in the breadcrumbs. Get some breadcrumbs both above and below the cutlet then use your hand to press the breadcrumbs into the meat. you should have a nice even coating of breadcrumbs with no "bald spots". Repeat with the rest of the cutlets. In a heavy bottomed frying pan, heat about 1/8" of oil until hot (you can test by dropping a breadcrumb into the oil, it should sizzle and float to the top quickly). Fry 1 or 2 cutlets at a time (depending on the size of your cutlets and pan). Wait till you see the edges turn golden then gently flip it over using tongs and fry till the other side is golden. Get a plate or wire rack with 3 layers of paper towels ready and transfer the cooked cutlets to the paper towel lined plate as they finish. Serve immediately with some capers and a wedge of lemon. Love schnitzel. Nice touch with the lemon and capers. I like the idea of adding onion to the veal before breading. I have to try that. One of my favorite dish. Simple and really good! My dad travels to Namibia to have veal at this German restaurant. Imagine if I could make this for him. I’m sure my inheritance would benefit from this. I have to say I’m one of the lucky ones since I rather have good memories of delicious schnitzels but that doesn’t mean I won’t try your version next time. I love the idea of giving it an onion boost! I don’t do the cooking, but Peter’s dad makes the.best.schnitzel.ever. It’s light and heavenly but then covers it will this most awesome gravy that is light as well but at the same time, really comforting. with capers. It’s funny I always thought Wiener Scnitzel was sausauge until I ordered it at Wallse. Great site! I love the format. Has anyone tried barbequing instead of frying schnizel?? I think with indirect heat it may be pulled off. Tel me if you have tried it. 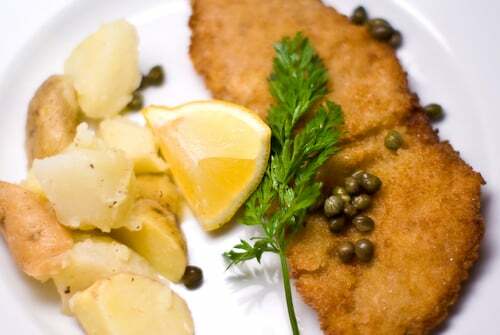 Wandered over here from the Squirrel Bread blog — as she just made this version of schnitzel. Looks fabulous! And how perfect for this time of the year. I’m thinking I might have to make some myself! !